If you sending currency other then PLN/EUR/USD – use PLN bank account, please. 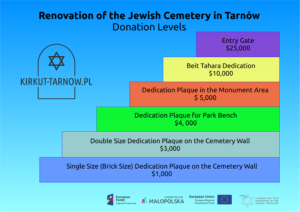 Please note in the special instructions that it is for the Tarnow Cemetery Restoration. This is a 501(c)(3) donor site and letters will be provided to donors for contributions. You can make cash donations by either bringing it directly to our Committee (Rynek 20-21, 33-100 Tarnów, Polska). Please do not mail any cash.